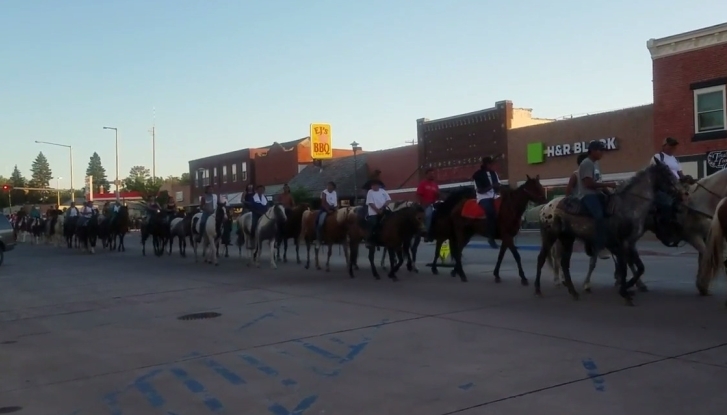 The ride is meant to honor the warriors of Lakota society – from the past to the present and even the future. Great warriors like Crazy Horse, for whom the ride is named, and for the warriors today serving in the armed forces. It also helps to teach the younger generation of Lakota youth the horse culture and even a bit of their own history. It encourages them to embrace their Lakota culture and to honor Lakota warriors of the past. The Lakota used the horse for their main mode of survival – the buffalo. The horse and its rider are of one spirit, and during a hunt this was apparent. It is still seen today how intertwined the spirit of the horse and the rider are, especially on the Crazy Horse Ride. It begins in Fort Robinson with a smudging ceremony to bless the 200 riders on their journey and the ride itself. Fort Robinson is the place where Crazy Horse was murdered during the surrender of the Lakota people in the late 1800s. The details surrounding the events that occurred during the time of his death are a sad time in the history of the Lakota people. The first day the riders cover 30 miles, and not all of the riders who begin will finish in Pine Ridge. Day two, they travel 18 miles, which takes the riders to the Beaver Valley Camp, where Crazy Horse had camped once before. A Youth Dedication Ceremony takes place here because the area holds a significance for the Oglala Lakota Oyate: it was rumored that after his death at Fort Robinson, Crazy Horse’s family brought his body to the Beaver Valley area and buried him there. The Youth Dedication ceremony is a special event due to what takes place during the ceremony. Many young people are given their Lakota names and war bonnets are awarded to certain riders. There are dances, songs and stories told during the ceremony also. The final stop for the weary riders is Pine Ridge, South Dakota. The sight of the riders coming into town is a thing to behold, hundreds of riders coming through town on their horses, carrying elaborate, colorful staffs and flags representing the tribes, the United States and the POW. Responses to "2018 Crazy Horse Ride honoring, Tasunka Witko and Native Veterans "